Various clinical trials have been performed with symptomatic slow-acting drugs for osteoarthritis (SYSADOA).6–9 Specifically, the Glucosamine/chondroitin Arthritis Intervention Trial (GAIT) was a randomised, double-blind, placebo-controlled study comparing the efficacy and safety of glucosamine hydrochloride and chondroitin sulfate, alone and in combination, and celecoxib for the treatment of knee osteoarthritis.10 While no statistically significant effects were observed for the combination group in the overall study population, a significant difference was observed for the combination arm in patients with moderate-to-severe pain for the primary outcome, defined as a 20% decrease in Western Ontario and McMaster osteoarthritis index (WOMAC) pain score (p=0.002). Additionally, patients with moderate-to-severe pain showed significant differences in the combination versus placebo group for Outcome Measures in Rheumatology Clinical Trials and Osteoarthritis Research Society International (OMERACT-OARSI) response (p=0.001), 50% decrease in WOMAC pain (p=0.02), WOMAC pain score (p=0.009), WOMAC function score (p=0.008), normalised WOMAC score (p=0.017) and Health Assessment Questionnaire pain score (p=0.03). To confirm these effects, the Multicentre Osteoarthritis interVEntion trial with Sysadoa (MOVES) was conducted to test whether chondroitin sulfate plus glucosamine hydrochloride has comparable efficacy to celecoxib after 6 months of treatment in patients with painful knee osteoarthritis. The MOVES trial was a phase IV, multicentre, non-inferiority, randomised, parallel-group, double-blind study. Patients were recruited consecutively by physicians in public or private practice at sites in France, Germany, Poland and Spain (see online supplementary table S1 for a list of investigators by study site and country). Eligible patients were ≥40 years of age, with a diagnosis of primary knee osteoarthritis according to the American College of Rheumatology, with radiographic evidence (Kellgren and Lawrence grade 2 or 3) of osteoarthritis, and severe pain (WOMAC pain score ≥301 on a 0–500 scale) at inclusion. Patients were excluded if they had concurrent medical or arthritic conditions that could confound the evaluation of the index joint or coexisting disease that could preclude successful completion of the trial such as history of cardiovascular or gastrointestinal events and were excluded due to use of celecoxib. The full list of selection criteria is detailed in online supplementary table S2. Eligible subjects were randomised to 400 mg chondroitin sulfate plus 500 mg glucosamine hydrochloride (Droglican, Bioiberica, S.A., Barcelona, Spain) three times a day or 200 mg celecoxib (Celebrex, Pfizer) every day for 6 months. Subjects were assigned sequentially in a 1:1 ratio using a computer-generated randomisation list prepared by an independent biostatistician (GD) using proc Plan SAS System (V.9.1.3) software. Subjects receiving combination therapy took six capsules of chondroitin sulfate 200 mg plus glucosamine hydrochloride 250 mg per day; those receiving celecoxib took one celecoxib 200 mg plus one placebo capsule (in the morning) and four further placebo capsules per day. To maintain the blind (among patients, physicians, site staff and contract research organisation), celecoxib capsules were overencapsulated and placebo capsules had an identical appearance to the combination product. Patients were allowed to take up to 3 g/day of acetaminophen as rescue medication, except during the 48 h before clinical evaluation. The primary outcome measure was defined as the mean decrease in WOMAC pain subscale from baseline to 6 months. Secondary efficacy outcome measures included: stiffness and function subscales of WOMAC; visual analogue scale; OMERACT-OARSI responder index;11 presence of joint swelling/effusion (see online supplementary table S3 for protocols for assessment); use of rescue medication (according to diary entries and tablet counts); patients’ and investigators’ global assessments of disease activity and response to therapy, and health status (EuroQol-5D) at 6 months. All outcome measures were assessed at 30, 60, 120 and 180 days. Safety outcomes included discontinuation of study treatment due to adverse events (AEs), changes in various laboratory measures and vital signs. The sample size was calculated to test the non-inferiority of chondroitin sulfate plus glucosamine hydrochloride versus celecoxib in the assessment of change in the WOMAC pain subscale. With 280 patients per group, the study would have 90% power assuming the expected difference in means was 0, the common SD was 26 (0–100 scale), according to previous studies,12–16 with a delta of eight units (0–100 scale),13 ,16 ,17 a one-sided significance level of 2.5% and assuming a 20% dropout rate. A delta of eight units in a range from 0 to 100 (the same as a delta of 40 units in the original range from 0 to 500) was used in the study. The main analyses were performed using the per-protocol population, defined as all randomised patients meeting the inclusion criteria, who received study medication, had a baseline and at least one postbaseline efficacy measurement (for the primary efficacy variable) and did not have major protocol violations. In non-inferiority trials, the per-protocol set is used in the primary analysis as it is the most conservative approach. Additionally, the primary efficacy analysis was performed according to intention to treat to test the robustness of the results.18 ,19 The safety population was defined as all randomised subjects who took at least one dose of the study medication. Continuous efficacy variables were analysed by means of a mixed models for repeated measurements (MMRM) approach, including time, treatment-by-time interaction and baseline value as a covariate. The variance–covariance matrix was unstructured. For categorical variables, Fisher's exact test was used for between-treatment comparisons, by time-point when applicable. Missing data in the main outcome were handled using a conservative approach by imputation using the dropout reason (IUDR) (the worst value for dropouts due to safety issues) or the last observation carried forward approach in case of lack of efficacy. Other reasons were not imputed and were handled by the MMRM approach, which relies on the missing at random assumption. Sensitivity analyses were conducted using the baseline observation carried forward (BOCF) and the MMRM with no imputation. The analysis was performed using SAS V.9.2 software (SAS Institute, Cary, North Carolina, USA), and the level of significance was established at the 0.05 level (two-sided). Recruitment began in September 2011 at 42 centres in France, Germany, Poland and Spain. The study was completed in April 2013. A total of 763 patients were screened and 606 underwent randomisation (figure 1). The main reasons for screen failure in 157 patients were high cardiovascular risk (n=36, 22.9%), patient decision (n=31, 19.8%) and low WOMAC pain score (n=23, 14.7%). Of the 606 subjects randomised, 568 (93.7%) were included in the intention-to-treat analysis and 522 (86.1%) in the per-protocol analysis. Of the 603 subjects included in the safety population, 465 (77.1%) completed the study, without differences between treatments (figure 1). Flow diagram of Multicentre Osteoarthritis interVEntion trial with SYSADOA (MOVES) patients. Hba1c, glycated haemoglobin; ITT, intention to treat; PP, per protocol. The mean±SD age at baseline was 62.7±8.9 years, 438 (83.9%) were women and 515 (98.7%) were Caucasian. The overall mean WOMAC pain score was 371.3±41.6, and Kellgren and Lawrence grade 2 changes were present in 327 (62.6%) of the subjects. The groups were well balanced at baseline (table 1). The primary and secondary efficacy outcomes are detailed in table 2 and figure 2. Western Ontario and McMaster osteoarthritis index (WOMAC) (A) pain, (B) stiffness and (C) function subscales, and (D) visual analogue scale by visit; (E) Outcome Measures in Rheumatology Clinical Trials and Osteoarthritis Research Society International (OMERACT-OARSI) responder criteria, (F) joint swelling, (G) joint effusion and (H) consumption of rescue medication, by visit. The p values compare values between treatments. Data are least-square means±SEM. CE, celecoxib; CS+GH, chondroitin sulfate plus glucosamine hydrochloride. The mean change from baseline to 6 months in WOMAC pain score was −185.7 (−200.3 to −171.1) (a decrease of 50.1%) in the chondroitin sulfate plus glucosamine group and −186.8 (−201.7 to −171.9) (a decrease of 50.2%) in the celecoxib group (figure 2A). The corresponding mean difference (95% CI) respected the non-inferiority margin of −40 units: −1.1 (−22.0 to 19.8; p=0.92) in the main analysis. 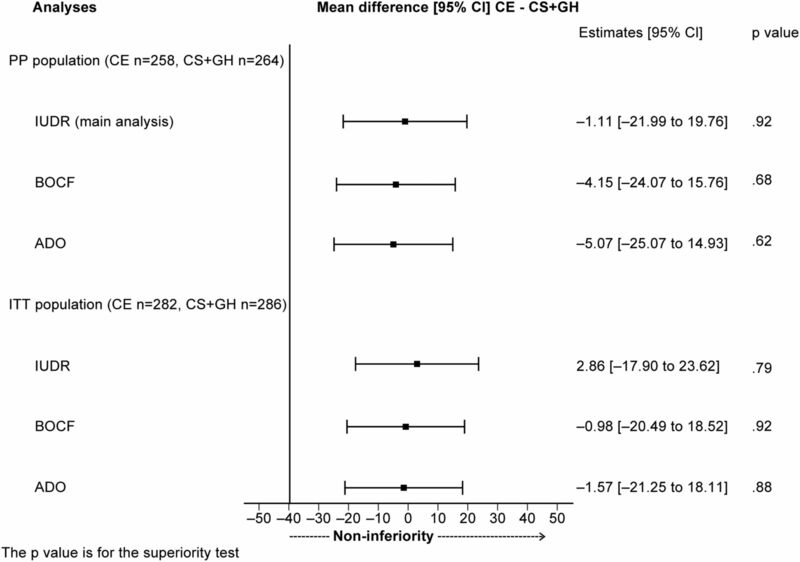 All sensitivity analyses confirmed the non-inferiority conclusion (figure 3 and online supplementary table S4). There were no differences at 6 months between treatment groups in the WOMAC stiffness score, with a decrease of 46.9% in the combination group, compared with a decrease of 49.2% in the celecoxib group (p=0.43; figure 2B); WOMAC function score, with a decrease of 45.5% in the combination group compared with a decrease of 46.4% in the celecoxib group (p=0.53; figure 2C) and visual analogue scale, with a decrease of 48.0% in the combination group versus a decrease of 48.8% in the celecoxib group (p=0.92; figure 2D). Similarly, there were no differences in patients’ (p=0.51) and physicians’ (p=0.33) global assessments of disease activity or response to therapy (p=0.74 and 0.70, respectively). Over 70% of patients fulfilled the OMERACT-OARSI criteria in both treatments from 120 days onwards (p=0.16; figure 2E). At 6 months, both treatments achieved a 79% response rate (p=0.91; figure 2E). Both groups elicited a reduction from baseline >50% in joint swelling (figure 2F), from 12.5% (33/264) to 5.9% (14/264) for chondroitin sulfate plus glucosamine, and from 14.0% (36/258) to 4.5% (10/258) for celecoxib (p=0.54). A similar reduction was also seen for effusions, from 6.8% (18/264) to 3.0% (7/264) and from 7.8% (20/258) to 4.1% (9/258), respectively (p=0.61; figure 2G). The consumption of rescue medication throughout the study was low and similar between treatments, except for the first month when use was higher in the combination group. No significant differences were observed afterwards (figure 2H). Mixed models for repeated measurements analysis, conducted using the following approaches for handling missing data: (A) imputation using drop-out reason (IUDR); (B) baseline observation carried forward (BOCF); and (C) available data only (ADO). The p value is for the superiority test. CE, celecoxib; CS+GH, chondroitin sulfate plus glucosamine hydrochloride; ITT, intention to treat; PP, per protocol. All components of the EuroQoL-5D showed improvements over the treatment period in both groups. At 6 months, no differences were apparent between groups in terms of mobility (p=0.16), self-care (p=0.94), usual activities (p=0.73), pain/discomfort (p=0.60), anxiety/depression (p=0.21) or general health status measured by the visual analogue score (p=0.54; table 2). The overall proportion of subjects having at least one treatment-emergent AE were 51.0% (155/304) in the chondroitin sulfate plus glucosamine group and 50.5% (151/299) in the celecoxib group. In total, 17 of the AEs were serious, 7 (2.3%) in the chondroitin sulfate plus glucosamine group and 10 (3.3%) in the celecoxib group. One serious AE was judged as definitely related to the study medication (allergic dermatitis) and one as possibly related (dizziness) (both in the celecoxib group); three serious AEs were judged to be probably related to the study group, two in the chondroitin sulfate plus glucosamine group (Helicobacter pylori gastritis and allergic reaction) and one in the celecoxib group (dermatitis psoriaform). The other 12 were deemed to be unlikely or unrelated to study medication. No deaths occurred in this study. A total of 44 of 603 (7.3%) patients discontinued the study medication due to an AE, 22 in each treatment group (figure 1). Parameters determined from blood and urine, vital signs and physical examination were similar in both groups. The MOVES trial found that a fixed-dose combination of chondroitin sulfate plus glucosamine has comparable efficacy to celecoxib in reducing pain in patients with osteoarthritis of the knee with moderate-to-severe pain after 6 months of treatment. The reduction in pain was both clinically important and statistically significant (50% reduction in both groups), as was the improvement in stiffness (46.9% reduction with the combination vs 49.2% with celecoxib), and function (45.5% vs 46.4%, respectively). Similar improvements were seen in visual analogue scale, the pain/discomfort dimension of EuroQoL-5D and patients’ and investigators’ assessments of disease activity and response to therapy without differences between treatments. Indeed, four-fifths of patients met the OMERACT-OARSI responder criteria in both groups. Other clinical symptoms, such as swelling/effusion, improved to the same extent in both groups and the consumption of rescue medication was similar. These results both confirm and extend those from the GAIT study in patients with severe knee pain. Chondroitin sulfate and glucosamine have a slow onset of response and provide long-lasting pain relief and functional improvement in osteoarthritis.6–9 In the current study, celecoxib was superior to chondroitin sulfate and glucosamine at 1–4 months (in terms of WOMAC scores and Huskisson's visual analogue scale), but by 6 months, response to chondroitin sulfate and glucosamine was similar to celecoxib (see online supplementary table S4). Studies have demonstrated anti-inflammatory effects of both glucosamine and chondroitin sulfate. Both inhibit metalloproteinase activity, prostaglandin E2 release, nitric oxide production and degradation of glycosaminoglycans, as well as stimulate the synthesis of hyaluronic acid in the joint. Chondroitin sulfate stimulates collagen synthesis, while glucosamine inhibits prostaglandin release.20–23 However, while each substance exerts beneficial effects on the processes underlying osteoarthritis, a number of studies have demonstrated that many of these effects benefit from the synergy observed with combined glucosamine and chondroitin sulfate treatment.24–27 In contrast, celecoxib inhibits prostaglandin biosynthesis, primarily through blocking the cyclooxygenase-2 enzyme, thereby achieving rapid reduction in signs and symptoms of osteoarthritis of the knee,28 but it does not alter other processes underlying the disease. This difference in the mechanisms of action is supported by the present results, which indicate more substantial and faster response for celecoxib than for chondroitin sulfate plus glucosamine up to 120 days, but by 6 months there are no significant differences between the two treatments across all outcomes. Indeed, the overall pain improvement calculated using area under the curve analyses was superior with celecoxib than with the combination (p<0.001 for the imputed per-protocol population and p=0.002 for the imputed intention-to-treat sensitivity population). While the present results are in accordance with data from other studies for the combination,10 ,29 ,30 and for celecoxib in painful knee osteoarthritis at the same dosage,10 ,12–14 ,22 direct comparisons are limited by differences in study designs and drug formulations. The only randomised double-blind study that allows the comparison of the combination of chondroitin sulfate plus glucosamine with celecoxib was the GAIT study.10 The data of efficacy and safety in the present study are consistent with those from GAIT in patients with severe knee pain. Chondroitin and glucosamine have been recommended in some practice guidelines for the treatment of osteoarthritis.31–33 Both chondroitin sulfate and the two commercially available salts of glucosamine hydrochloride or sulfate are available as prescription medicines in the European Union for the treatment of osteoarthritis. The clinical evidence to support these medications is, however, conflicting.10 ,34–38 Consequently, current evidence-based guidelines on the management of osteoarthritis focus on topical treatments and oral analgesics,31 ,39 ,40 and some39 ,40 advise against treatment with chondroitin sulfate and glucosamine on the basis of lack of efficacy evidence, but not on potential harm.39 Conversely, the suboptimal efficacy and possibility of serious adverse drug reactions with long-term use of analgesics, NSAIDs and opioids are well recognised. 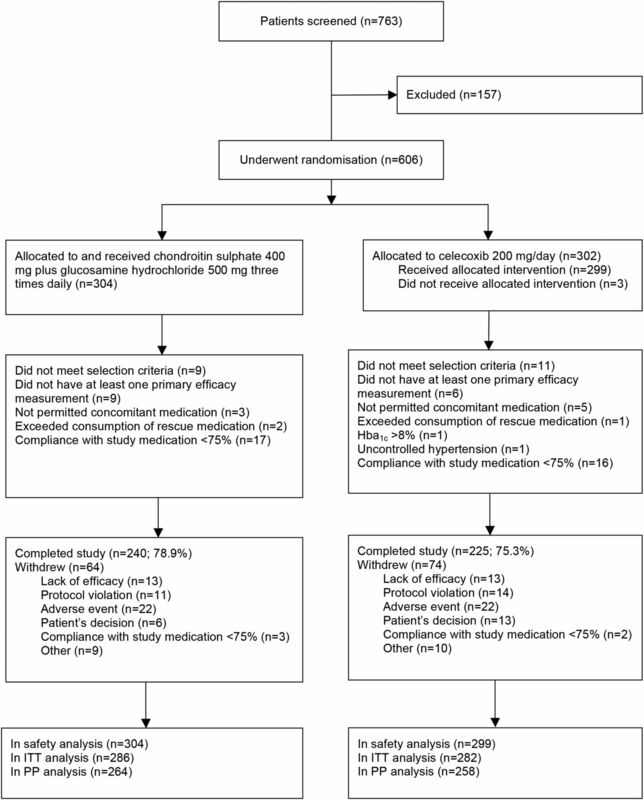 The present study, conducted in patients with osteoarthritis of the knee with severe pain, provides robust data to demonstrate the long-term efficacy and safety of chondroitin sulfate plus glucosamine in the management of these patients, and suggests that this combination may, in addition, offer an alternative, especially for individuals with cardiovascular or gastrointestinal conditions who have contraindications for treatment with NSAIDs. These results confirm that the combination of chondroitin sulfate plus glucosamine hydrochloride has proven non-inferior to celecoxib in reducing pain. 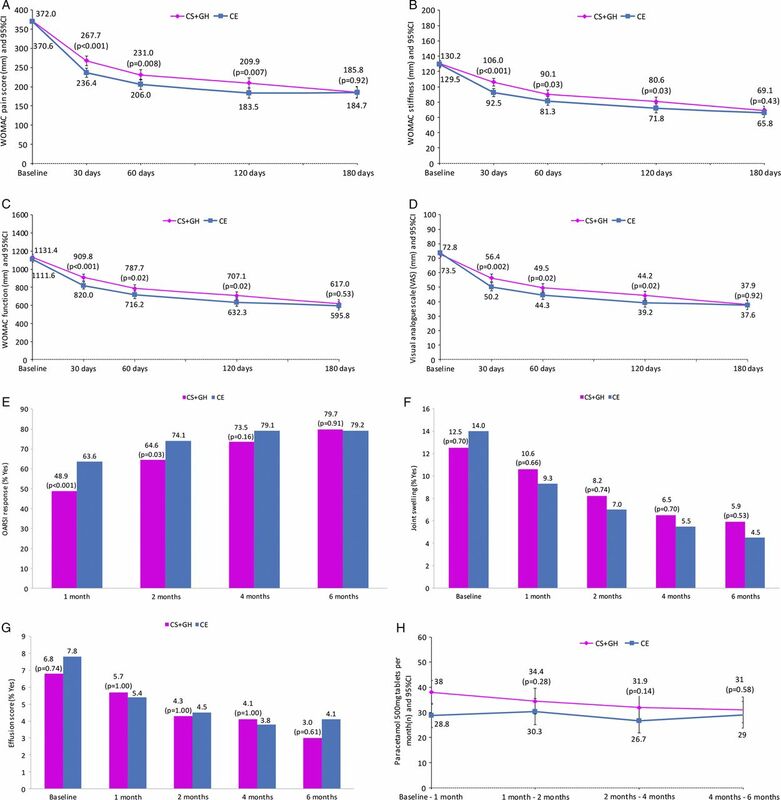 No differences were found for stiffness, functional limitations, joint swelling and effusion after 6 months of treatment in patients with severe pain from osteoarthritis of the knee, and the combination has a similar good safety profile and tolerability. This combination of SYSADOA appears to be beneficial in the treatment of patients with osteoarthritis of the knee and should offer a safe and effective alternative for those patients with cardiovascular or gastrointestinal conditions.
. Nonsteroidal anti-inflammatory drugs and the incidence of hospitalizations for peptic ulcer disease in elderly persons. Am J Epidemiol 1995;141:539–45.
. Comparison of the antiinflammatory efficacy of chondroitin sulfate and diclofenac sodium in patients with knee osteoarthritis. J Rheumatol 1996;23:1385–91. Committee for Proprietary Medicinal Products (CPMP). CPMP/EWP/482/99 Final. Points to consider on switching between superiority and non-inferiority. London: European Medicines Agency, 2000.
. Chondroitin and glucosamine in the management of osteoarthritis: an update. Curr Rheumatol Rep 2013;15:361.
. Inhibition of articular cartilage degradation by glucosamine-HCl and chondroitin sulphate. Equine Vet J Suppl 2002(34):224–9.
. Glucosamine, chondroitin, and manganese ascorbate for degenerative joint disease of the knee or low back: a randomized, double-blind, placebo-controlled pilot study. Mil Med 1999;164:85–91. American Academy of Orthopaedic Surgeons. Treatment of osteoarthritis of the knee. Evidence-based guideline. Correction notice This article has been corrected since it was published Online First. Figure 1 has been corrected. Contributors MCH, JM-P and J-PP contributed equally to this work. MCH had full access to all of the data in the study and takes responsibility for the integrity of the data and the accuracy of the data analysis. MCH, JM-P, JM, IM, JRC, NA, FB, FJB, PGC, GD, YH, TP, PR, AS, PdS and J-PP were responsible for study concept and design, acquisition, analysis or interpretation of the data, drafting of the manuscript and study supervision. IM, JRC, NA, FB, FJB, PGC, GD, TP, PR, AS, PdS and J-PP were responsible for critical revision of the manuscript for important intellectual content. GD was responsible for the statistical analysis. Additional contributions: Sophie Rushton-Smith, PhD (Medlink Healthcare Communications, UK) drafted the paper based on detailed information and guidance provided by the lead author, including published abstracts, and information provided by the sponsor, including the study protocol, statistical analysis plan and results. She also coordinated and integrated the comments and modifications suggested by all authors upon review. Her effort was funded by Bioiberica SA. Funding This trial was funded by Bioiberica SA, Barcelona, Spain. The sponsor provided all of the study medication free of charge and met the expenses that arose during the course of the study. The sponsor also participated in the study design and data interpretation. Competing interests MH is a consultant to Bioiberica SA, Bristol Myers Squibb, Eli Lilly, EMD Serono SA, Iroko Pharmaceuticals, Novartis Pharma AG, Pfizer, Samumed LLC and Theralogix LLC, and owns stock in Theralogix LLC. JM-P is a shareholder of ArthroLab and has received consulting fees from AbbVie, Bioiberica, Merck & Co, Servier, and TRB Chemedica. JM received personal fees for lectures from Bioiberica SA and Merck Sharp & Dohme during the 36 months prior to this publication. FJB has received grants (for clinical trials, conferences, advisory work, and publications) from Abbvie, Amgen, Bioiberica, Bristol Mayer, Celgene, Celltrion, Cellerix, Grunenthal, Gebro Pharma, Lilly, MSD, Merck Serono, Pfizer, Pierre-Fabra, Roche, Sanofi, Servier, Tedec-Meiji and UCB. YH has received speaker fees from IBSA, Bioiberica and Expanscience, consulting fees from Galapagos, Flexion, Tilman SA, Artialis SA and Synolyne Pharma, and research grants from Nestec, Bioiberica, Royal Canin and Artialis SA. PdS acts as a consultant for WEX Pharmaceuticals and has received payment for lectures from Bioiberica. J-PP is a shareholder of ArthroLab and has received consulting fees from AbbVie, Bioiberica, Merck & Co, Servier and TRB Chemedica. Ethics approval Local health authorities and the institutional review board of each centre approved the study. The trial was performed according to the ethical principles of the Declaration of Helsinki and to Good Clinical Practice. Data sharing statement Additional unpublished data from the MOVES trial may be obtained by contacting Dr. Josep Verges, c/o Bioiberica S.A., Barcelona, Spain.